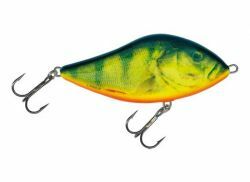 Salmo Slider Wobbler: This lure is a true virtuoso in a big family of lures all designed for large predators. Left and right, left and right: the Slider's sinuous dance that leads predators to crimes of passion! A lust to murder, a volcano of aggression. Foaming sprays of water and the scream of reel brakes, that's what awaits you: anytime soon. Crush down the barbs from your trebles to make unhooking easier. Take a deep breath and prepare yourself for a lot of action! If you were to ask what is new in fishing lures, you would have to say the new generation of sub-surface walking baits called the Slider. With a gentle downward pull of your rod, the Slider bolts to life with a sudden flash and glides almost 90 degrees from the angler. Another pull results in a sudden change in the opposite direction that simply is irresistible to pike, bass and muskie. How to fish with Slider. Usually the Slider is fished with a regular series of rod strokes while retrieving the quickly, the rod strokes should be quite energetic and fast. Before fishing proper you should always make a few casts and practise retrieves in clear water to watch the Slider's behaviour and get your timing right, when you do the Slider will turn acutely from side to side, each turn at a right angle to the direction of retrieve. Do not allow slack line to form after each jerk, for one thing it is important to have a tight line so you can set the hook when you have a take but also the sharp turns of the Slider can take it back over the line and may tangle if it is not properly controlled. Other "schools" of Slider fishing have developed, the Slider works so well that many different styles of retrieve will work under different conditions. Whatever style you choose and find effective you should concentrate to make sure you maintain that style, so you must be aware of your Slider's behaviour at all times. The style of retrieve pattern that you choose is very important, for instance when water temperatures are very low (2° – 5°C) the best results will be achieved by fishing slowly, with pauses of up to 3 seconds long between jerks, and those jerks should be gentle. The sinking Slider is obviously the right tool for this style, there is subtle movement from the lure as it sinks which is an additional attractor for predators. When water temperatures are higher then the retrieve speed should be increased. The Slider is surprisingly good for shallow trolling, let it out between 10 and 30m behind the boat and jerk it just as you would when casting, every couple of seconds. While fishing with Slider retrieve the line with high speed. After each jerk the lure will make acute turns to both sides, so it will be moving towards you relatively slowly. Use this unfailing trick - while retrieving the line with constant speed, jerk a couple of times stronger, then 2-3 times a little bit weaker. This kind of varied action of your lure will not allow any pike in the vicinity to stay indifferent to it.